I struggle with winter perfumes. Summer is easy – something light and green and fresh usually suits (Bulgari Eau Parfumée au Thé Vert is my current favourite), but in winter that feels too austere and pale. I want something warm and spicy and rich, but also elegant and not too sweet. Since almost any floral notes seem to become overpowering and sickly sweet on my skin that’s quite an ask! I was passing through duty free today on my way to Austria, and as part of my ongoing quest for the perfect winter perfume I sampled one of the most famous (or infamous) perfumes of all time – Opium. 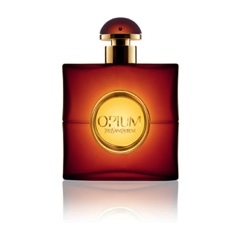 The creation of Jean Amic and Jean-Louis Sieuzac of Roure, Opium was released in 1977, and almost immediately became the signature scent of the era. Some people love it, others hate it, but it certainly can’t be accused of being boring. I wasn’t around in 1977 to witness Opium’s launch and the ensuing frenzy, and as for the controversial adverts – well – they can’t exactly be described as subtle or elegant! They never really appealed, so I hadn’t tried Opium before; and to me this had the air of trying on one of my (very glamourous) aunt’s designer dresses from 30 years ago. The first thing that hit me was the slightly numbing scent of cloves and a rich, sweet amber note. Within about ten minutes, lilies and a whisper of jasmine had taken over, but they quickly faded into patchouli and cinnamon. It was opulent, spicy, warm and lovely, but after an hour or so it blended strangely into aldehydes and floral notes, and I was startled to find myself smelling like carnation soap! Thankfully the florals faded after a while, and it slowly turned from soap through resin to a rich, sweet, shadowy accord of amber, sandalwood and incense, which lasted the rest of the day. It’s very potent stuff – even after a long shower a whisper of the scent still lingered on my skin – so you only need a drop or two. The Renaissance Man likes it, but I’m not totally convinced – I really didn’t enjoy the hour I spent smelling like soap from a cheap hotel! (The things I do in the name of research….) On the other hand, the rest of the time it was wonderfully warm and opulent and complex and spicy, without ever veering into the danger zones of powderiness or over-sweetness. It has a lot more personality than most modern perfumes too, which I like.